A couple of weekends ago I was taking a class called Soldering for Virgins and it was exactly that! It was an all day class and you need all of this time to really learn each of the steps of soldering. 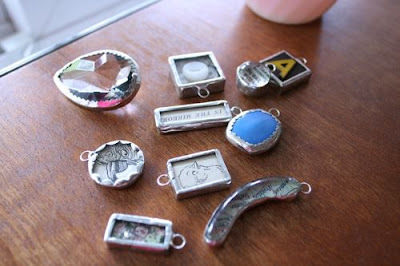 You cannot skip over steps or try to make it easier - Sally Jean's way is pretty tested and we all followed along as she broke everything down and came out of there with completed charms! I am pretty bummed because I am having issues again with iPhoto (totally my fault) I lost all of my pictures from that day. She has a gorgeous studio in the Pearl in Portland and you can see it in her book Pretty Little Things: Collage Jewelry, Trinkets and Keepsakes and in issue one of Where Women Create. I tried years ago teaching myself how to solder - unsuccessfully. I bought her book and I tried it at a "make n take" one time. But could really never get the hang of it and fearful that I was doing something wrong that tends to be VERY hot. So when Sally Jean emailed me at the last minute to let me know that there was an opening in her class I jumped at the opportunity! (ALWAYS get on the waiting list.) I learned so much in seven hours and had my 'aha' moment soldering: Flux is your BEST friend! It is also very important to have the right tools, it makes all the difference. Her book that I reference above has a list of recommended suppliers. I am lucky enough to live really close to Cline Glass Company. This place sells everything you would need to get started, they do phone orders. This is the soldering iron that you will want to buy if you are going to be doing multiple projects. My plan is to make some Christmas ornaments for gifts this year! Sally Jean's husband Brad is selling pre cut glass on Etsy. This is the prefect way to buy good quality glass that is cut and also has the corners rounded for you. If you have a chance to take one of her workshops I highly recommend it!